I have long hesitated to post anything on what everyone seems to be saying about the differences in the way that Pope Francis has been ruling so far as I think that the arguments people have been having are rude toward both Pope Francis and Pope Emeritus Benedict. I think that over at the blog “Roma Locuta Est” he puts it best when talking of his defense of Pope Emeritus Benedict and Pope Francis. And now, I offer a few of my thoughts on the subject. 1. Pope Benedict XVI is now Pope Emeritus he is no longer the reigning Roman Pontiff. 2. Pope Francis is the current reigning pope. 3. Benedict no longer has the graces and abilities of the office because he is no longer the reigning Roman Pontiff. 4. Pope Francis after having been elected by the College of Cardinals has all of the graces and abilities of the Office of Peter. 5. 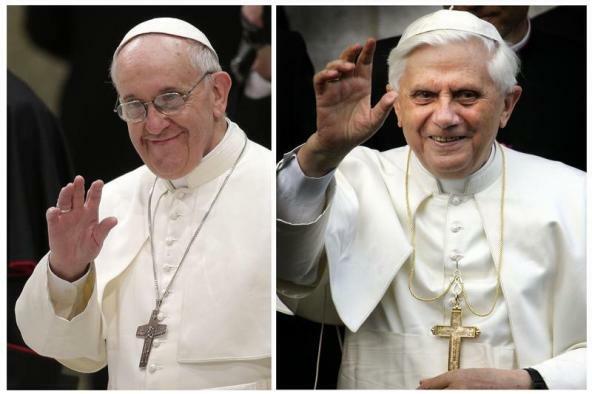 Pope Francis and Pope Emeritus Benedict have different liturgical styles. I could go on and on with the different facts that seperate the two of them, but I think that you are catching on. Pope Benedict is no longer pope. He has done great things for the church, and because he is still human some things might not have gone as they should. Pope Francis is now the pope, he will do great things for the church, and because he is human as well he will probably have some moments that the outcome is iffy on. What matters is that WE HAVE A POPE! We have a pope who will continue to speak up for those teachings of the Faith. We have a pope who will continue to lead Christ’s church and be a shepherd to all people of good will in the world. We have a pope who is Christ’s Vicar on Earth. So let’s all give in to watching the movement of the Spirit in the church. Let us continue to pray for Pope Emeritus Benedict as he is in Retirement, but let us also join him in praying for the Papal ministry of Pope Francis. Let us pray for our church that Pope Francis now guides and let us ask Holy Mother Mary to continue to wrap her protective mantel around all of us. In the words of Fr. Baker: “The only important thing in life is going to Heaven, in the end nothing else matters.” LIfe is but a passing moment, lets all stop and take some time and learn about Pope Francis and enjoy it! Let’s pray for the church still going strong for 2000 years. Even though, I was only alive during the end of his papacy I will always consider myself a part of the JPII generation of Youth and the great message of the Theology of the Body and the Sanctity of Life which we are charge with bringing to the world. I will consider myself a seminarian of Pope Emeritus Benedict, because of his example and his works that inspired me to consider the seminary. And now I will consider myself with a special bond with Pope Francis, as he now shares my patron saint for a name. Popes come and go, the church goes on. I have lived through the reign of 3 popes, and I hope that I will live through many more. And let’s join in praying an AVE right now for these holy men and thank-God for the gift of them in our life.